I must be the meanest Mom around. First of all, we didn’t watch the Rose Parade. Well, we couldn’t, because we don’t have a TV. Halfway through last year, realizing that the only time we watched the thing was, well, on New Year’s Day for the Rose Parade, we moved it out to the garage and reclaimed a nice chunk of the family room for more important things (i.e. a bookcase). Besides, I really dislike parades. I don’t much like firework shows either. And I’ve never been to a baseball game. This year I plan to apply for U.S. citizenship, and I truly hope these facts do not impinge upon my application’s acceptance. I did make donuts this morning, so I’m pretty sure my kids didn’t really miss the parade much. I would like to report that I put the proper amount of salt in my batch of donuts, but the fact that I accidentally doubled it, given the 14 year old’s unfortunate misreading of the same measurement last night, is completely inexcusable. Fortunately I noticed right away, so I was able to fish the extra salt out of the bowl. Most of it, anyway. 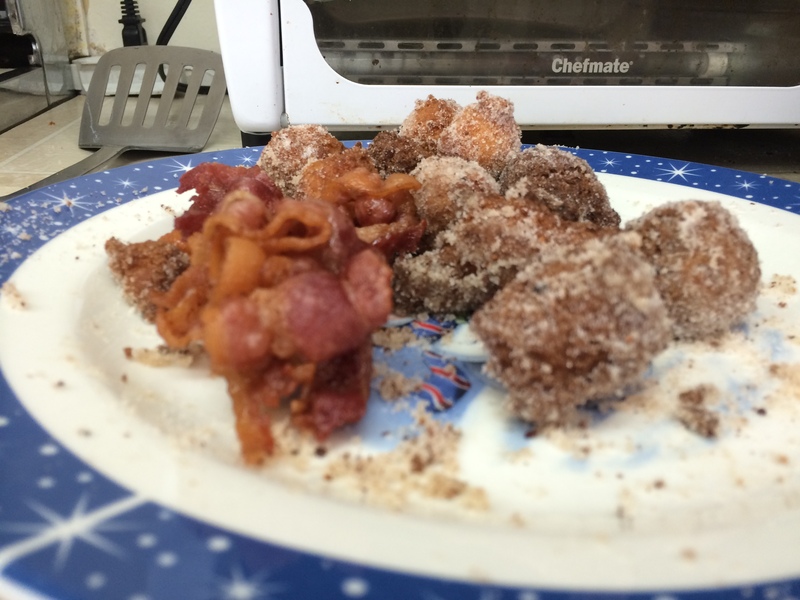 The 14 year old completed our nutritionally bankrupt meal this morning by deep frying some bacon. Big pot of oil, just the right temp… how could she not? Once I had them all sugared up on donuts, I dropped the bomb. We would be doing our school work today. My resolve stayed flinty, even in the presence of heartfelt wails of injustice. “But it’s a HOLIDAY, Mom.” “But even the BANKS are closed today, Mom.” Nothing moved me. I happen to know that both of my younger kids are quite a few lessons behind in their math, among other things. I also happen to remember hearing multiple promises of “I’ll catch up over Christmas break” in the past month or so. So I put my foot down and pointed out that if they hadn’t taken little personal holidays on days when there was no excuse for not doing their school, they wouldn’t be doing school today when everyone else had the day off. Unfortunately for them, I possess the ability to compartmentalize doom for days, even weeks at a time, as long as there are enough fires that need to be put out and other deadlines that need to be met. My last deadline was Boxing Day, when we visited with my side of the family to exchange gifts. It took exactly five days of not having a deadline looming on the horizon for me to realize how many things I had been letting slip for the past few months. I had my crisis yesterday, while they were at the movies enjoying The Hobbit. Today it was their turn. They will thank me later. Like, next Thursday, when they get to their respective Classical Conversations classes and actually have something finished to turn in. As firm as my resolve is today, given the freshness of my Biannual I-can’t-do-everything-I’m-supposed-to-do Meltdown, I sincerely hope and pray that it will continue, at least until the end of this semester. Because I know myself too well to think that this one foot planting itself firmly today is going to remain that way without major changes being made, not in my kids’ hearts and attitudes, but in mine. And I know how I am. 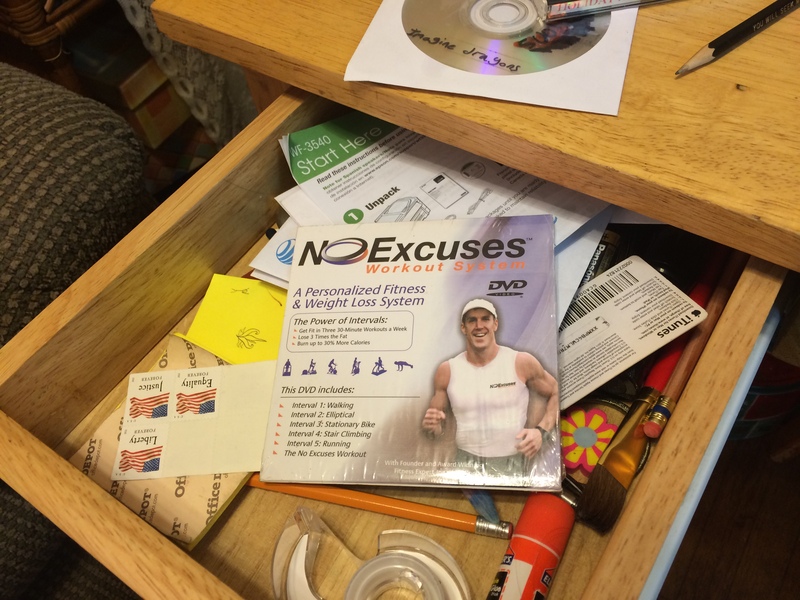 For example, my husband found this workout program in a drawer the other day, unopened. I bought it at least four years ago. You can do it! You big meanie ….